Cooking from scratch meal for 90-100 patrons with donated ingredients.Our fully equiped kitchen also comes with many hands to do prep work and dishes. If you love being in the kitchen and are available 10-4 on a week day, we need your help. 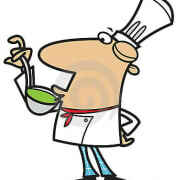 Volunteer cook opportunities.